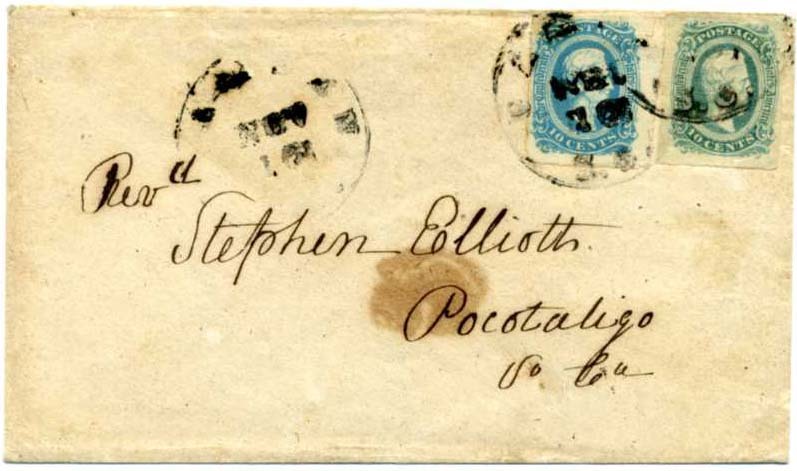 CSA 11-ADa, 10¢ milky blue tied CAMDEN / S.C. in combination with 10¢ greenish blue CSA 11c on cover to “Revd Stephen Elliott, Pocotaligo, So Ca”, cover with small central tone spot. 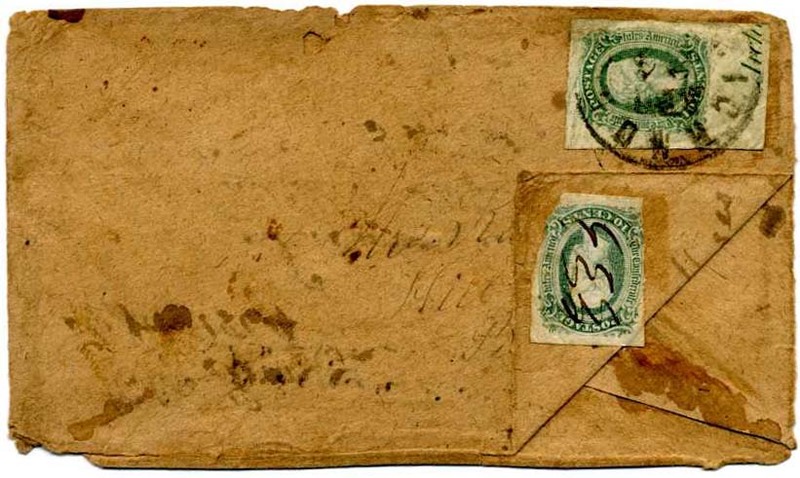 Most attractive and unusual double rate cover. $230. CSA 11-AD, 10¢ blue (4 large margins) tied socked-on-the-nose NEW MARKET / VA // 11 / 0CT cds on cover to “Mrs. A. C. Hopkins, Care of Col. S. Bassett French, Richmond, Va”. Col. Chester S. Bassett French was Jackson’s aid during the war as well as Virginia Governor Letcher’s aid - a lawyer who wrote his memoirs after the war. Ex Wiseman and Green. $130. 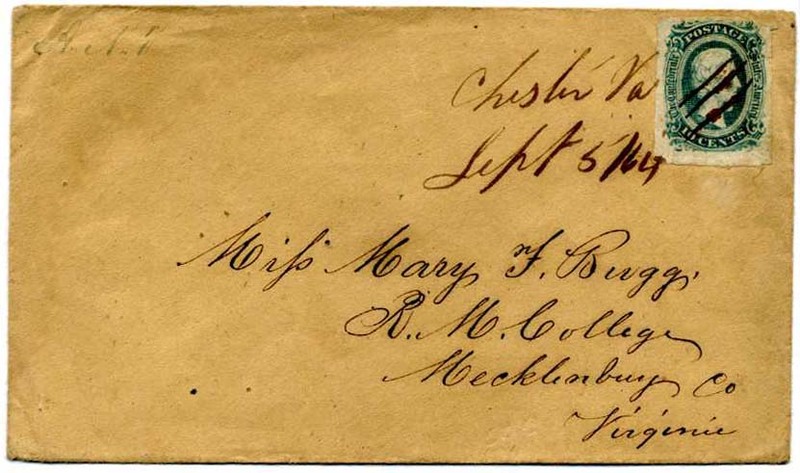 CSA 11-ADe, 10¢ blue Officially Perforated 12½, tied on immaculate homemade cover by weak strike (GRIFFIN) GA. cds, endorsed "W. J. Rhodes, Army of Tennessee" [Wm J. Rhodes was a Lieutenant in Co. G, 31st Ala. Infantry] and addressed to his wife in Talladega, Ala.; slightly reduced at left, Very Fine, Ex Crouch. $1,300. CSA 11, 10¢ blue tied GRIFFIN / GA. // OCT / 30 cds on homemade cover Americus, Georgia, Ex Crouch $160. CSA 11-ADa, 10¢ milky blue shade (4 uneven margins) tied neat bold GRIFFIN / GA. // JUL / 19 cds on homemade cover, Ex Crouch. $140. 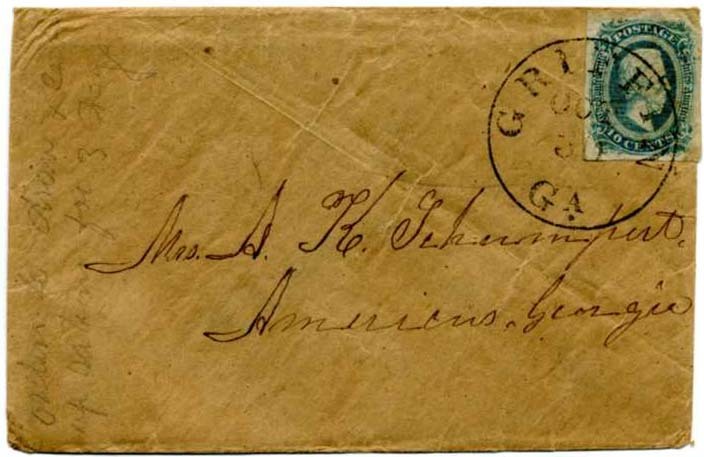 CSA 11, 10¢ blue tied ATHENS / Ga. cds on TURNED COVER addressed to “Wm. 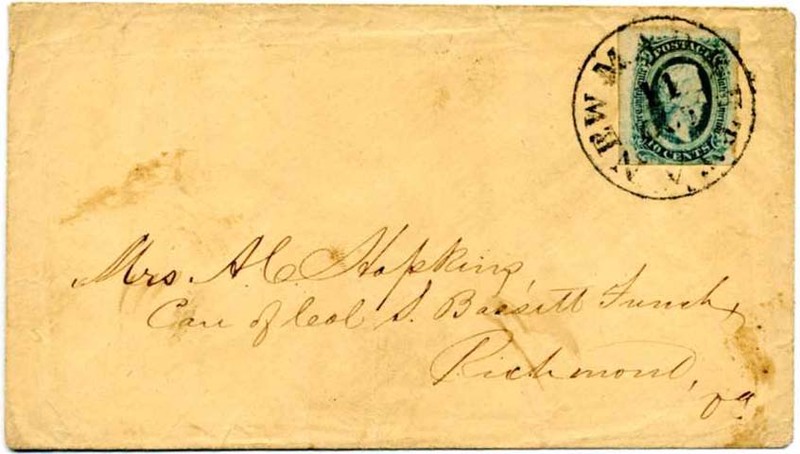 M. Blanton, Griffin, Ga” with inside use bearing a second CSA 11, 10¢ blue tied ATLANTA / Ga. cds addressed to “Elizabeth Pope, Athens, Ga.”, Very Fine, Ex Crouch. $350. 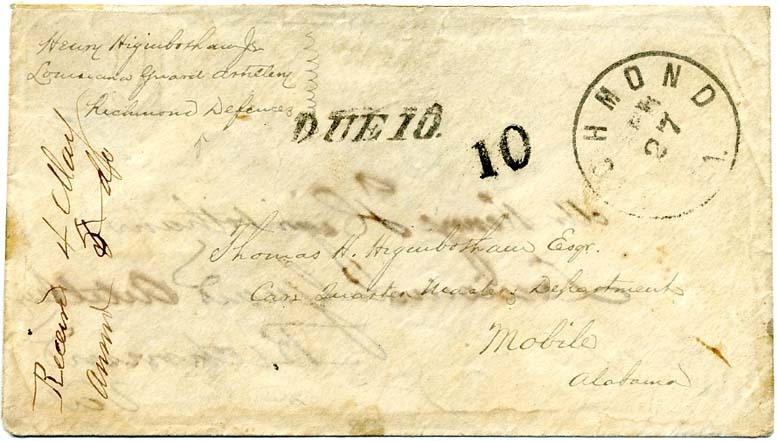 CSA 11, 10¢ blue left sheet margin copy tied CHARLESTON / S.C. // JUN / 27 cds on cover to Griffin, Ga., tiny edge repairs across top, Ex Crouch. $140. CSA 11-ADc, 10¢ greenish blue tied by clear strike of ARMY / OF / TENN three-line field post handstamp on homemade cover to “Mr. Murphy Lanier, Greenfield Colquitt Co., Georgia”. 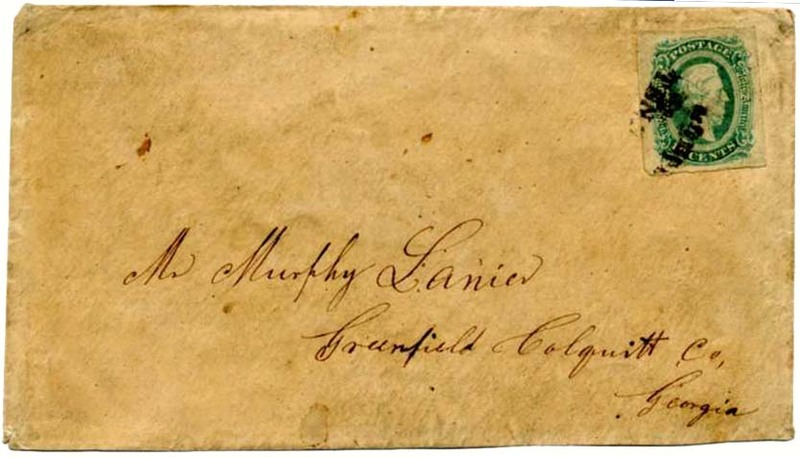 There are numerous soldiers by the name of Lanier, but no doubt some diligence would turn up the right one to whom to attribute this correspondence; bottom back flap missing. 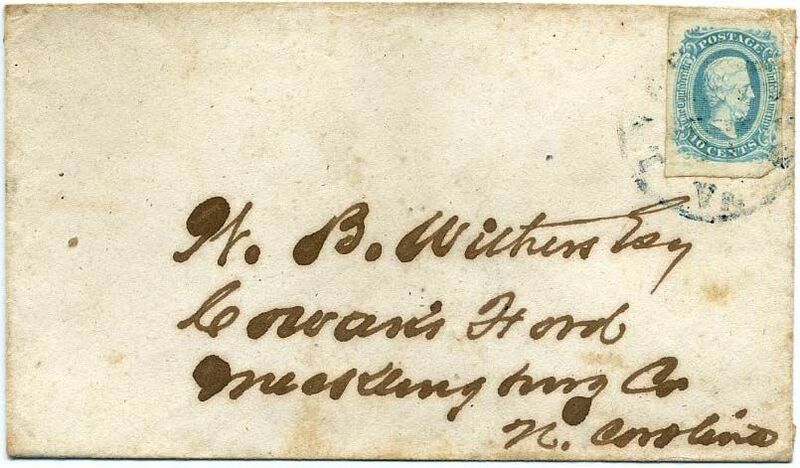 This desirable cancellation is rarely found tied, as it is here. Ex Walske. $900. CSA 11, 10¢ blue tied CHATTANOOGA / Ten. // OCT / 10  Army field cancel on cover to “Mrs. 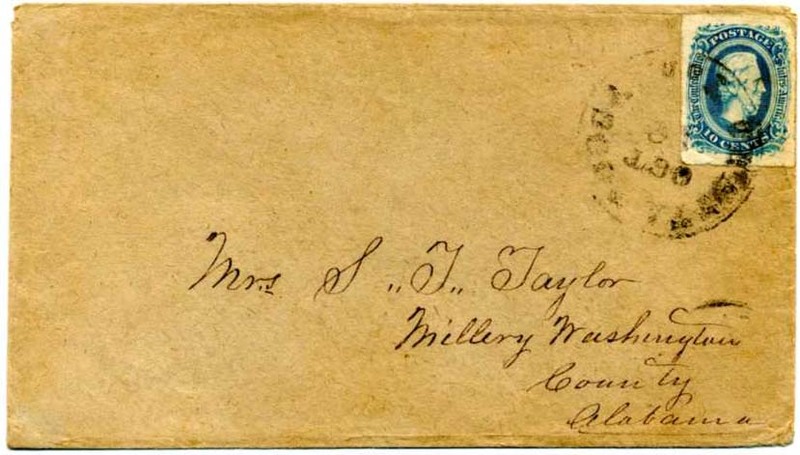 S. T. Taylor, Millery Washington County, Alabama”. 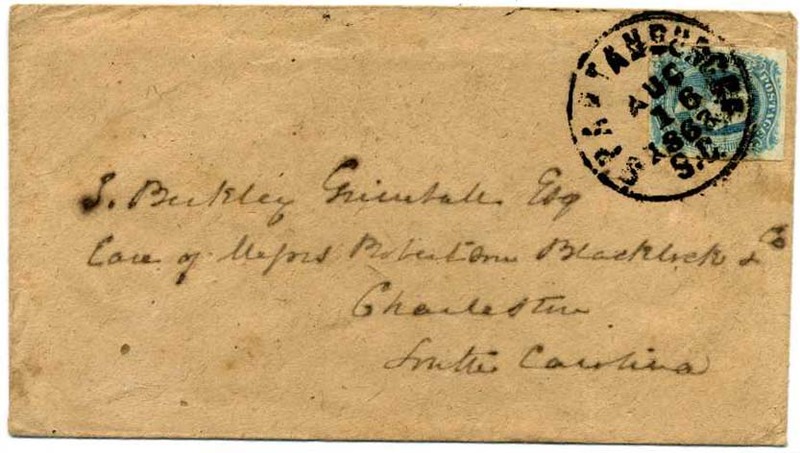 A nice use of the "roving" Chattanooga datestamp, taken from the city post office after evacuation and used as an army field office marking from September to January 1864. Ex Walske. $325. CSA 11, 10¢ blue tied CHATTANOOGA / Ten. // DEC / 15  Army field cancel on cover to “Mrs. W. B. Kendrick, Americus, Georgia” and “Care of W. B. Kimbrough”. 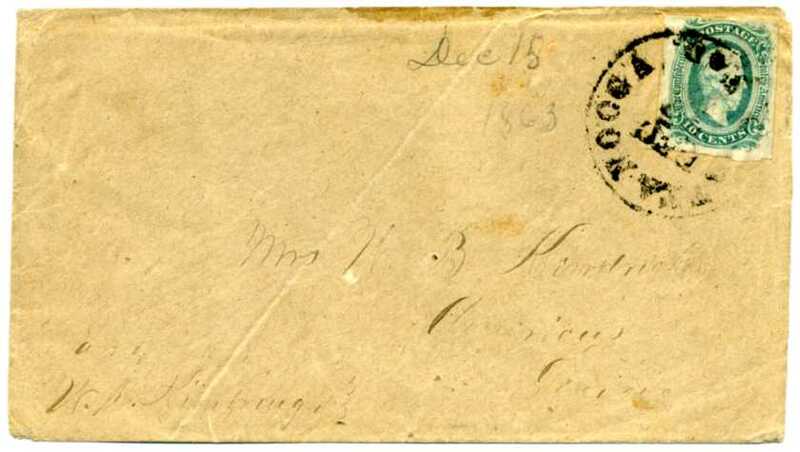 A nice use of the "roving" Chattanooga datestamp, taken from the city post office after evacuation and used as an army field office marking from September to January 1864. Ex Green and Walske. $325. CSA 11, 10¢ blue manuscript canceled with neat clear WOODVILLE / Mi[ss] // OCT / 20 cds on spectacular adversity cover fashioned from sheet music cover entitled “Bouquet de Music pour le Piano” in large fancy type, addressed to “Capt. 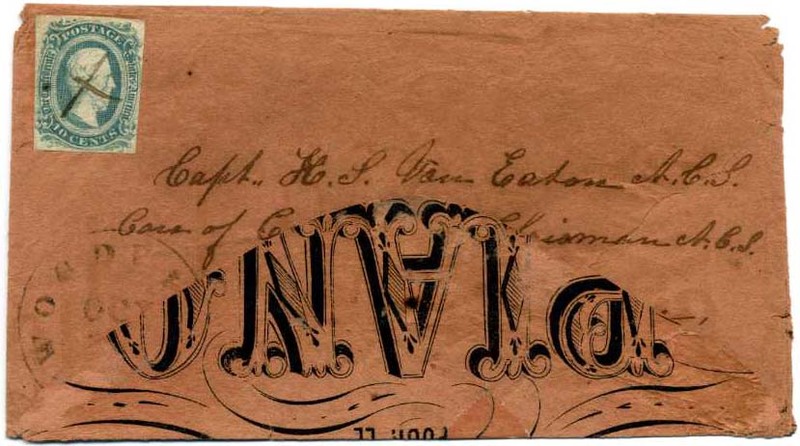 H. S. Van Eaton, A.C.S., Care of Capt J.B. Chrisman, A.C.S. 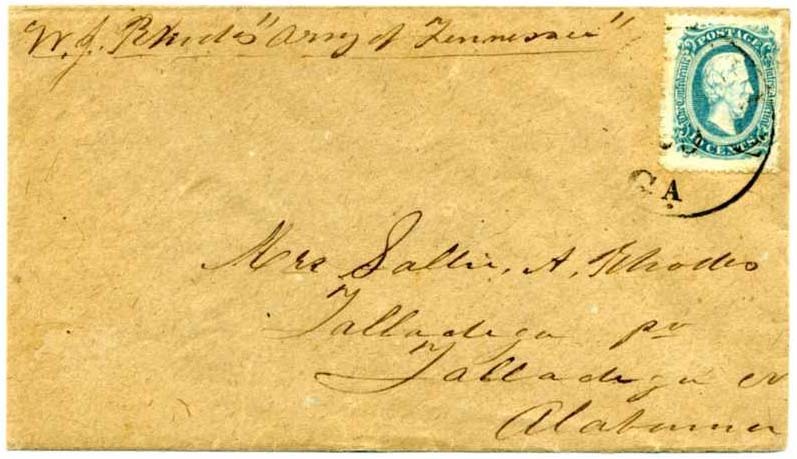 Brookhaven, Mississippi”, ink erosion in address and large sealed tear mostly hidden by the turned display flap, Very Fine appearance. Detailed records of Van Eaton and Chrisman included, as well as regimental history of the 16th Miss. $600. Henry Smith Van Eaton (1826-1898) was a lawyer and politician. More information on linked page. 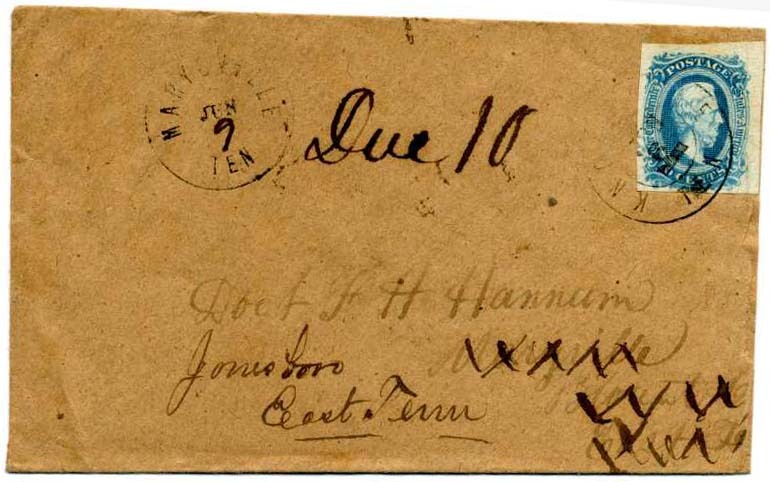 CSA 12 left sheet margin single 10¢ blue used with manuscript cancel of H[ampden] S[idney] College Feb 4  on homemade turned cover addressed to John H. & Samuel Tyne, Lynchburg, Virginia; inside use with ripped off 10¢ stamp addressed to Hampden Sidney College, small original note enclosed, late use. $250. 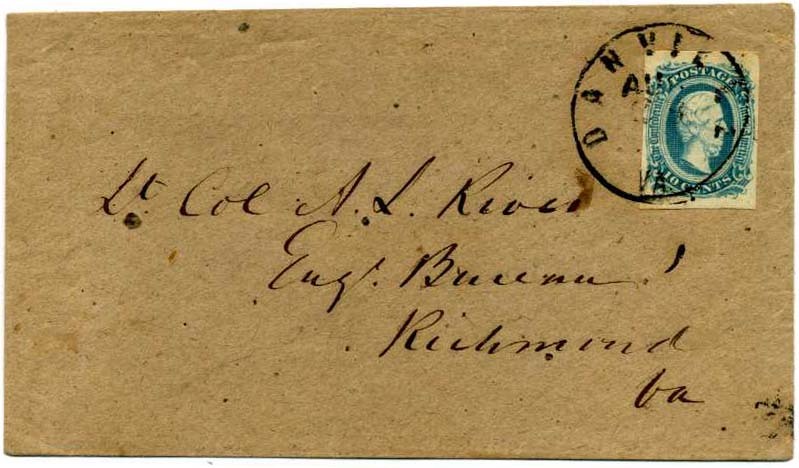 CSA 11, 10¢ blue) tied DANVILLE / VA // AUG cds on fresh cover to Lt. Col. A. L. Rives, Eng[ineer] Bureau, Richmond, Va. Alfred L. Rive’s father, William Cabell Rives, was a member of the Confederate Congress, formerly. served in the U.S. Senate and House, as well as having served as Ambassador to France. $180. 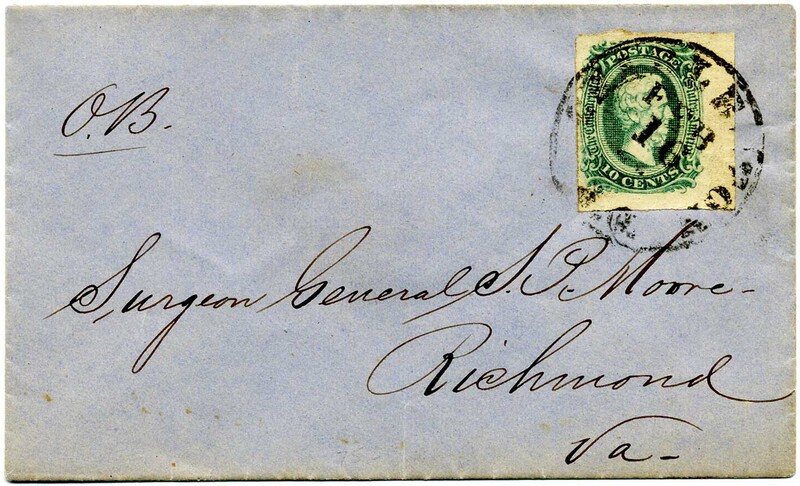 CSA 11-ADc, 10¢ greenish blue (4 margins) tied bold WELDON / N.C. // NOV 1863 cds on small cover addressed to Miss Margaret M. Burton, Lynchburg, Va but with a full note apparently from the addressed Margaret back to the sender, Interesting, Ex Morris Everett. $110. 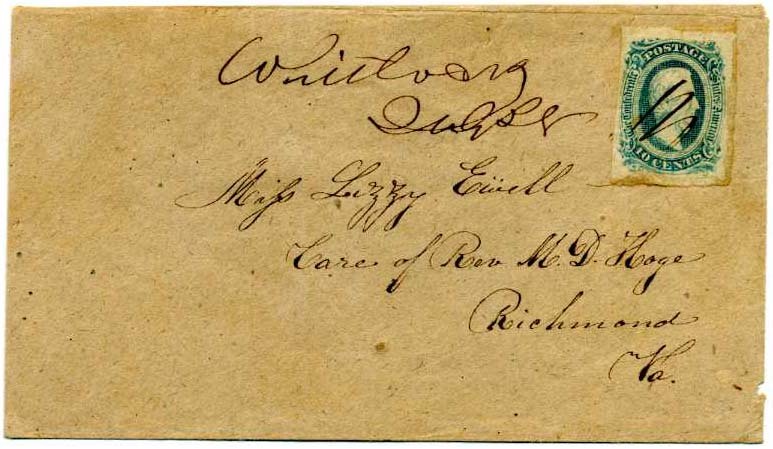 CSA 11, 10¢ blue 4-margin copy used with manuscript cancel of Whitlock Va July 28 (Halifax County) on cover to Miss Lizzy Ewell, Care of Rev M D Hoge, Richmond, Va, Very small post office (population 26), Ex Harvey Sheppard. $250. 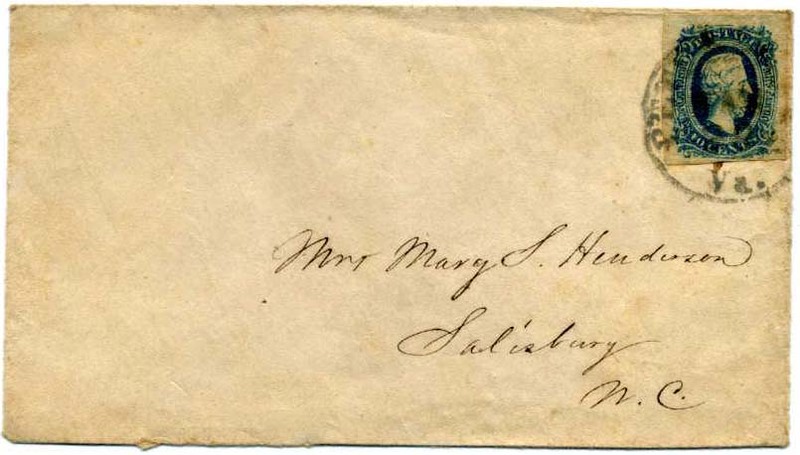 CSA 11- KB, 10¢ deep blue (4 large margins) tied BLACK PETERSBURG / Va. cds, late 1864 or 1865 use – black Petersburg cancellations only used very late in the war, addressed to Mrs. Mary S. Henderson, Salisbury, N.C., 2010 SCV $200. $250. 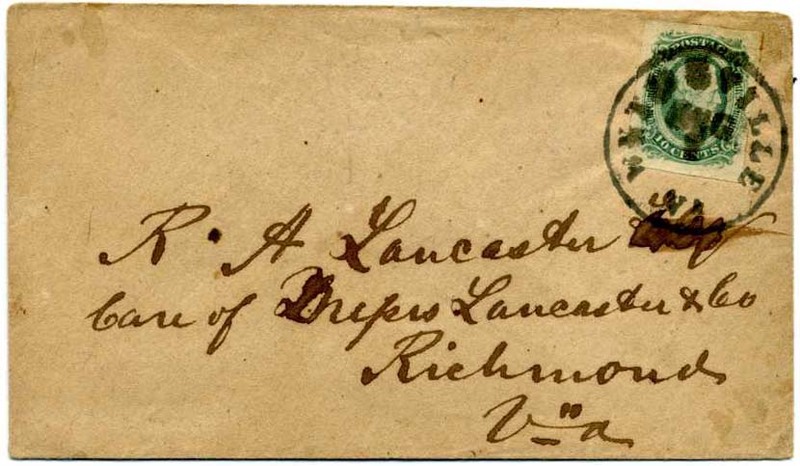 CSA 11-ADd, 10¢ green (4 margins) tied blurry WYTHEVILLE / VA. cds on cover to R H Lancaster, Esq Care of Messrs Lancaster & Co, Richmond, Va., Scarce shade. $250. CSA 11, 10¢ blue left sheet margin single tied WILMINGTON / N.C. // 5 PAID // NOV / 5  cds – canceler made from altered pre-war 3-PAID device – on fresh cover to Mr. W. S. Pettigrew, Near Raleigh, N.C., Very Fine. $180. CSA 11-ADd, 10¢ green bottom imprint sheet margin with “ARCH” at bottom (small faults), awesome margins all around, tied RICHMOND / VA cds on cover (erosion hole at top front) to Hill Grove, Pittsylvania with Pittsylvania C.H., Va. backstamp on back flaps of turned cover; inside is manuscript canceled CSA #11c (cut in at left) with manuscript cancel of Yellow Branch, Va. Nov 28  and yet another manuscript cancel of undetermined Virginia town dated 13 Jan 1864. Appears this side was used twice? Inside is addressed to “Lieut. Joseph Moses, Comp[any] G, 53rd Va. Brigade, Barton’s Brigade, Pickett’s Division, Richmond, Va.” Members of the 53rd Virginia were present from the first battle at Big Bethel to the bitter end during Lee's retreat. $350. CSA 11-AD, 10¢ blue (4 margins) tied neat Army of Northern Virginia field grid on nice adversity cover made from military form. $300. CSA 11-ADa, 10¢ milky blue tied PITTSYLVANIA C.H. 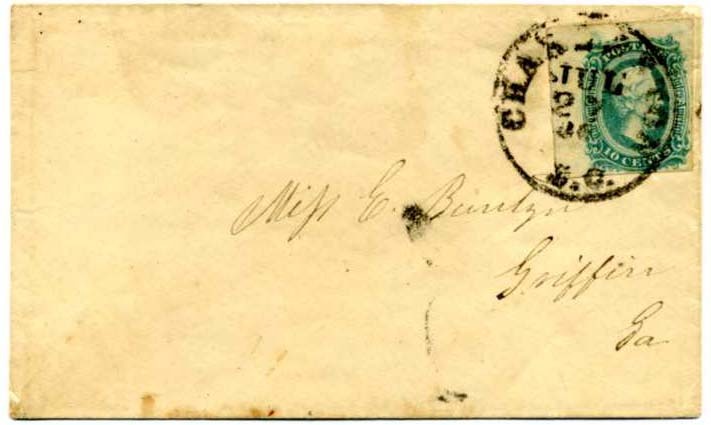 / Va. // MAY / 28 on adversity cover made from printed lined form addressed to George D. Wise Esq, Care of Gen[eral] H[enry] A. Wise, Richmond, Va., George Wise was a nephew of General Henry Wise; George served as a captain during the war, was a lawyer by trade and served as Virginia Commonwealth Attorney and in several U.S. Congresses after the war. $220. 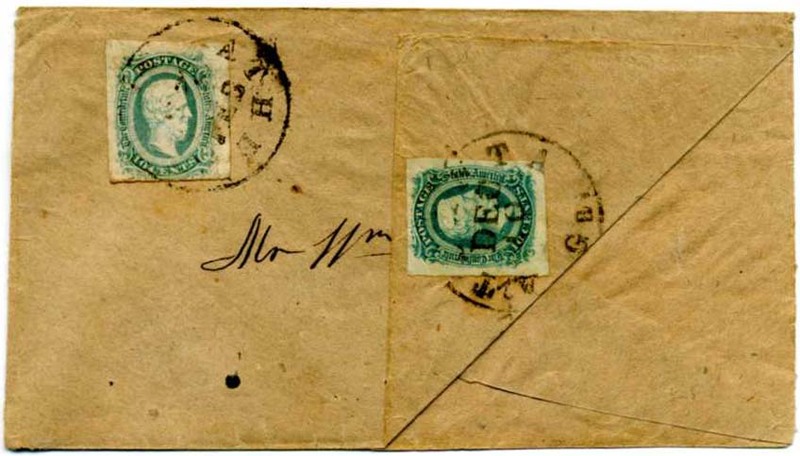 CSA 11-ADc, 10¢ greenish blue (4 large margins, slight gum stains) tied neat MARIETTA / GEO. 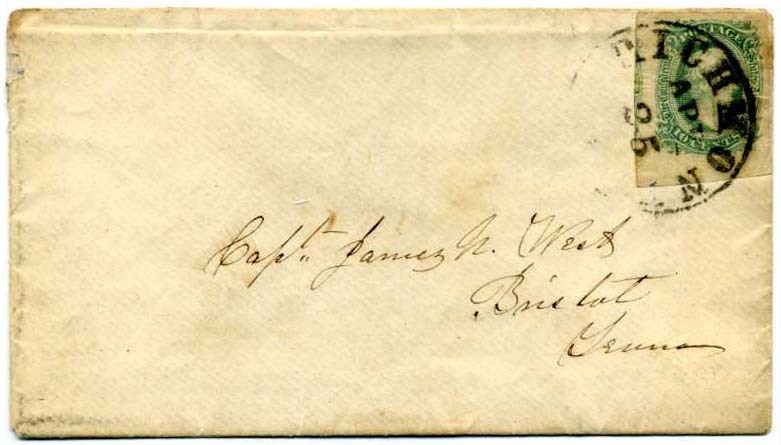 // DEC / 20 cds on neat blue commercially made envelope addressed to Mr. Jacob L. Thomas, Care Maj. Jno Bransford, Dalton, Ga. , Very Fine, Ex Morgan; Major John S. Bransford was on CS Gen & Staff. $180. 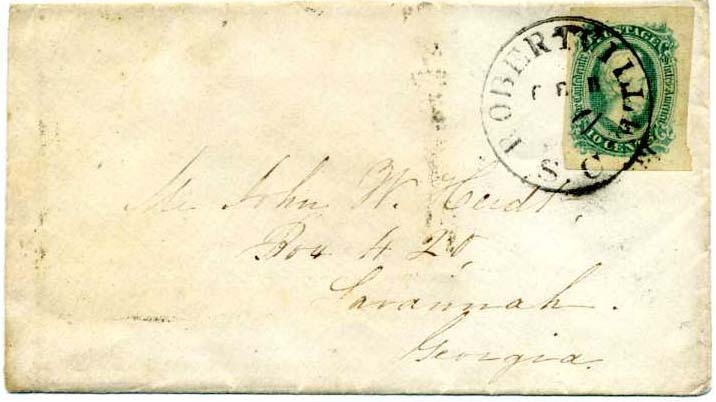 CSA 11-ADc, 10¢ greenish blue right sheet margin copy tied neat WARRENTON / GEO // APR / 16  on adversity cover fashioned from prior letter, addressed to Hon A H Stephens, Crawfordsville, Ga. , unusual in that top back flap is present (most removed from this correspondence at the time) but usual docketing on verso “C. 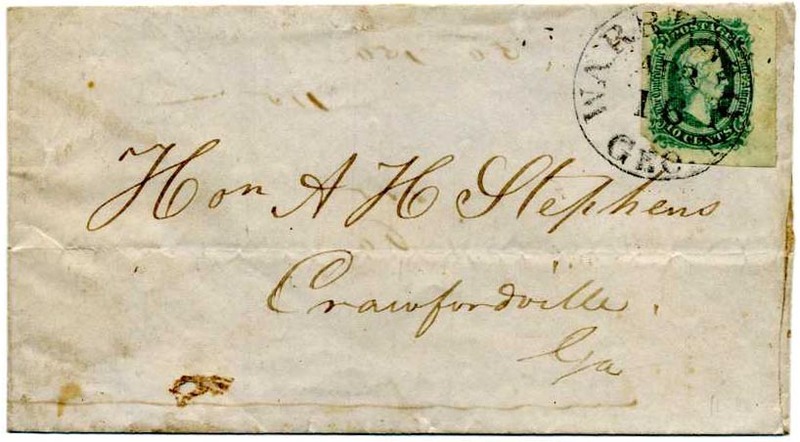 Pemble April 16 1864 Warrenton, Ga ‘About oil’.” By the middle of the War, Stephens and President Davis were at odds on how to handle the War, which caused Stephens to spend more and more time at his quiet Crawfordsville home. $220. 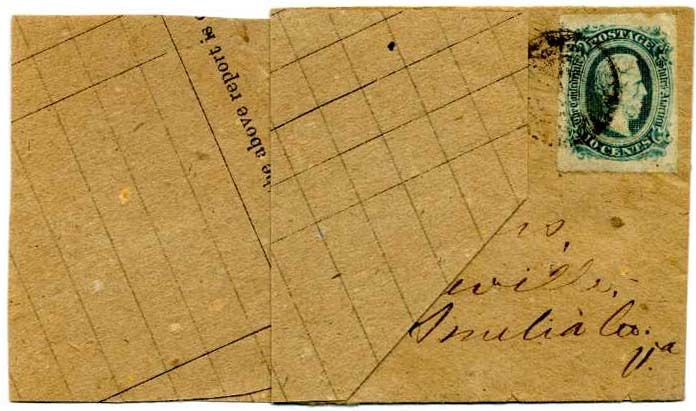 CSA 11-AD, 10¢ blue (4 margin) tied by illegible CDS on blue adversity cover fashioned from an Atlantic RailRoad document, addressed to Miss Mattie W. Howell, Selma, Alabama; could be cut to show “Atlantic Rail-Road” which falls to left center. $220. CSA 11-Ada, 10¢ milky blue tied blue dateless CHARLOTTE / N.C. CDS on cover to John N. McEllwee, Rock Hill, S.C., docketing shows from Drucker & Steele Aug 6 63. $200. CSA 11, 10¢ blue tied ms “Chester Va // Sept 5 / 64” cancel on homemade cover to “Miss Mary F. Bugg, R(andolph) M(acon) College, Mecklenburg Co., Virginia”. Chester is in Chesterfield County, Virginia. Chester was defined by being a stop on the Richmond and Petersburg Railroad and was also the scene of a battle. 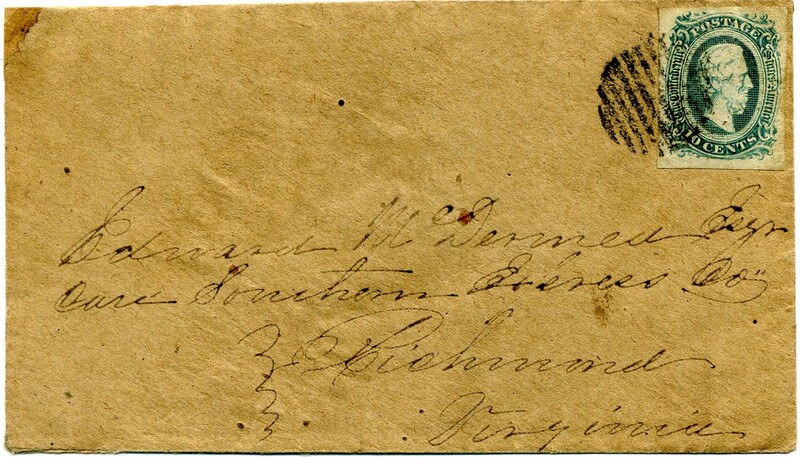 Faint water stains; light contemporary “A.N.V” (Army of Northern Virginia) at upper left so no doubt from a soldier but no docketing as it was paid instead of sent “due”. There were numerous soldiers by the name of Bugg from Virginia so more research needed. 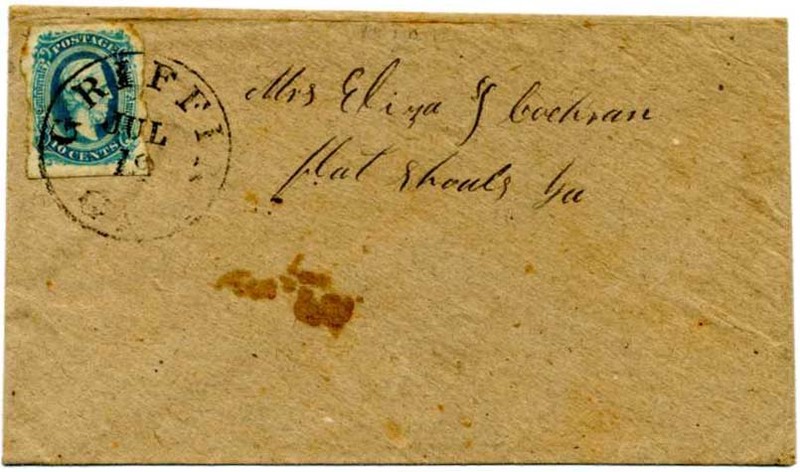 Scarce manuscript cancel. $110. 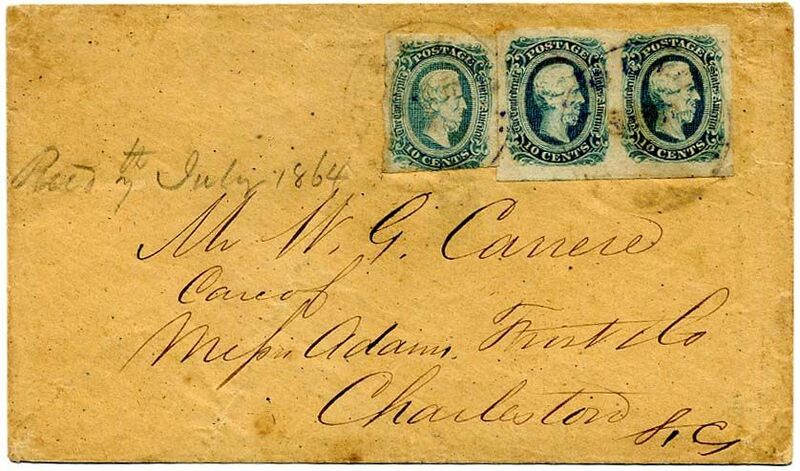 CSA 11-AD, 10¢ blue (likely right sheet margin) tied KNOXVILLE / TEN // JUN / 5 cds on cover to Doct. F. H. Hannum, Marysville, Blount Co, East Te. which has been crossed out and redirected to Jonesboro, East Tenn with manuscript Due 10 and MARYSVILLE / TEN // JUN / 9 (in ms), slightly reduced at right, Ex Boshwit, Wonderful forwarded use from a known correspondence; See my article re a new provisional discovery from this interesting correspondence at CP1Q2010_HANNUM.pdf A great deal of information about the family is contained therein. $450. 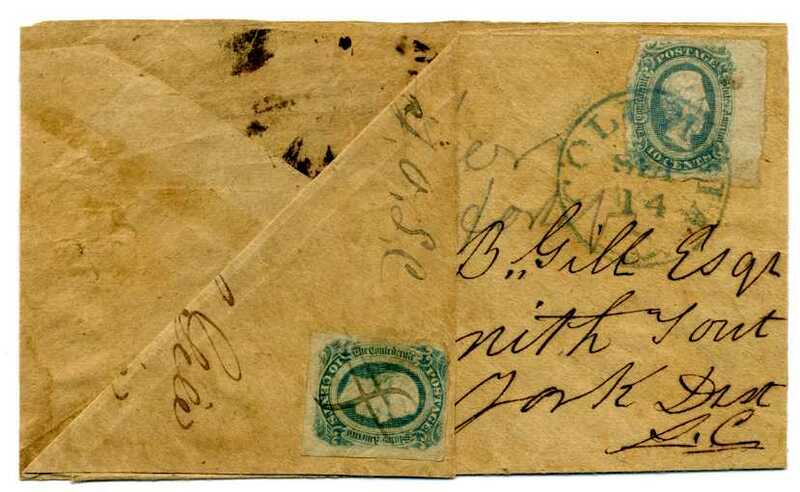 CSA 11, 10¢ blue tied bold SPARTANBURG / S.C. // AUG / 16 / 1863 cds on cover to J. Berkley Grimball, Esq., Care of Messrs Robertson Blacklock & Co., Charleston, S.C.; Ex Gallagher. $150. CSA 11-AD, 10¢ blue top sheet margin copy used with manuscript Mayesville SC Nov 24 manuscript cancel on fabulous adversity cover made from U.S. Army medical supply form with printed inventory such as litters and stretchers, medicine chests and other medical supplies; addressed to [Private] James M. Reid Care of Capt H. R. Garden, “Palmetto Lt. Battery” Haskell Battalion, Richmond, Virginia. During the war, Reid was detailed as a carpenter. He was paroled at Appomattox on April 9, 1865. At that time he was 30 years old, 5’9” tall. Ex Hambrecht. $450. 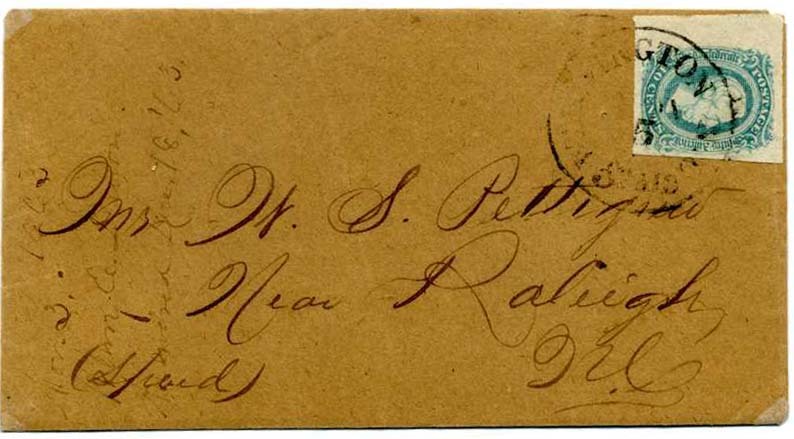 CSA 11, 10¢ blue with huge margin at left showing part of adjacent stamp tied neat PROCTORS CREEK / VA // JUN / 26 / 1863 cds on cover to Miss Kate McGeeley, Smith’s Bridge, Robeson County, N.C. $140. 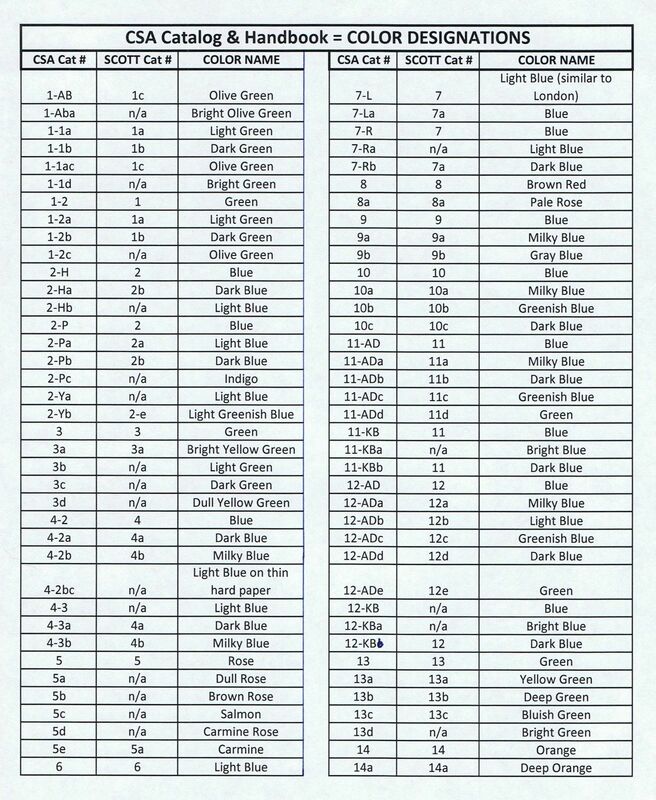 CSA 11c, 10¢ bluish green (huge margins, light pre-use wrinkling) tied RICHMOND / VA // APR / 25 cds on cover to Capt. James N. West, Bristol, Tenn. $140. CSA 11, 10c blue tied MOBILE / ALA double circle pmk on wonderful adversity cover to Mrs. E. H. Mosby, Lauderdale Station, Miss; open 3 ½ sides, fashioned from M & O.R. Road Transportation rail receipt, Mobile with illustration of a train; a total charmer! $400. 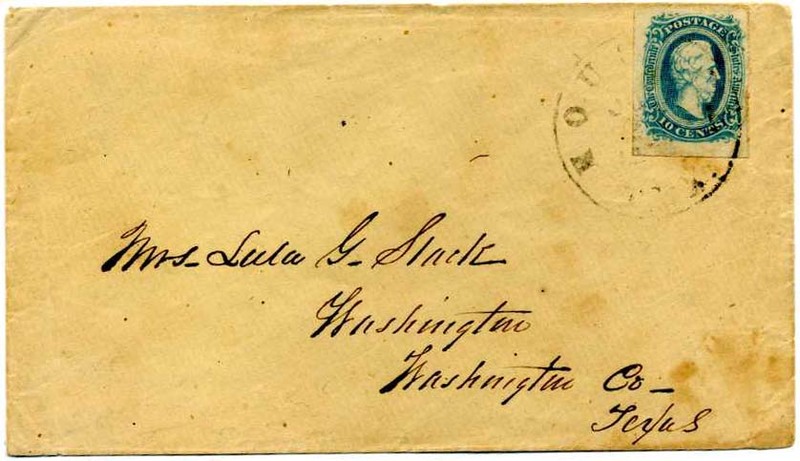 CSA 11-Ada, 10¢ milky blue (4 margins) tied HOUSTON / TEX cds on cover to Mrs. Lula G. Stack, Washington, Texas. $250. 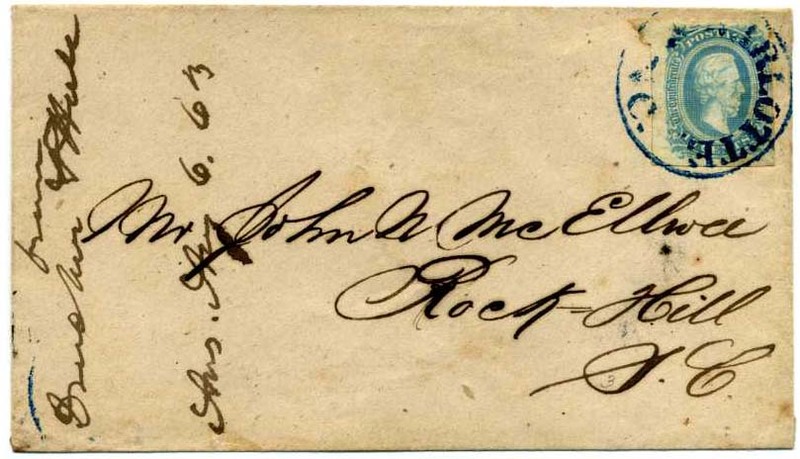 CSA 11, 10¢ blue right sheet margin tied blue COLUMBIA / S.C. // SEP / 14 on turned cover addressed to John G. B. Gill Esqr., Smith T[urn] Out, York Dist[rict] S.C.; inside use franked with CSA #12, 10¢ blue used with manuscript cancel of Smith T[urn] Out / Sept 16 to Lieut. George C. Gill, Columbia, So. Ca. Open 3 sides, Ex Kohn. $400. 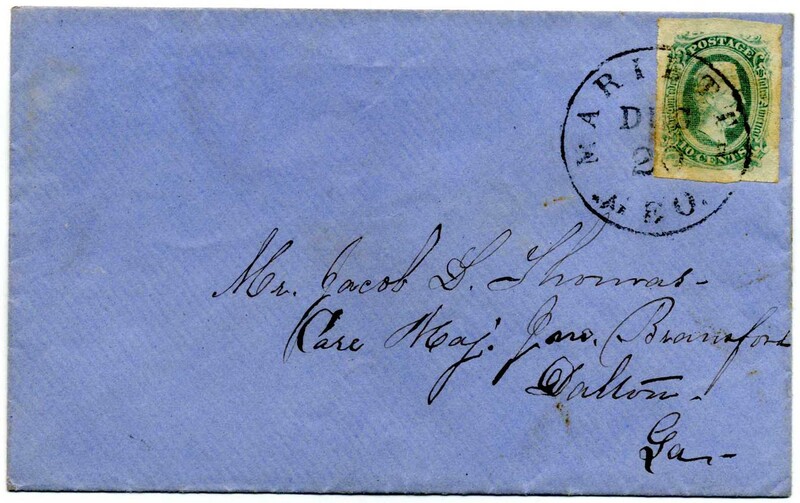 CSA 11, 10¢ blue type I tied together with pair of CSA 12, type II, stamps tied together by indistinct VIOLET cds on cover to W. G. Carrere Care of Messrs Adams Frost & Co., Charleston S.C.; faint postmark with part practically invisible and rest punctuated with bright dots of color. 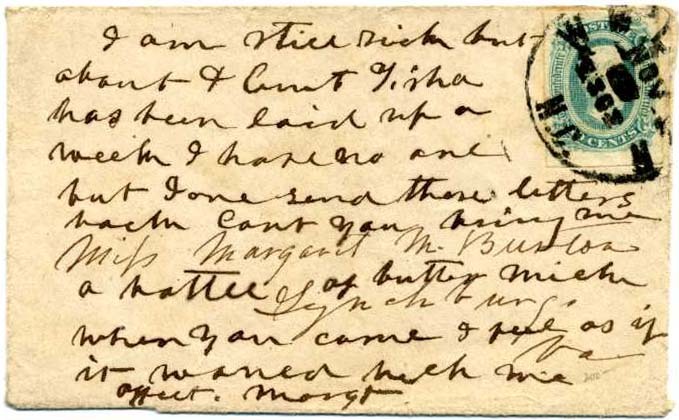 Ms pencil docketing “Recd 7th July 1864”. Molesworth notes on verso indicate PF Certificate which is missing. 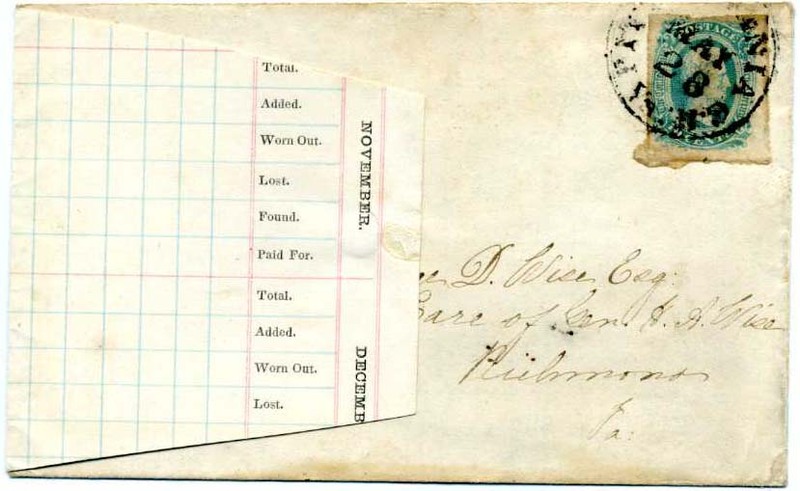 Wonderful triple rate mixed franking. $350. 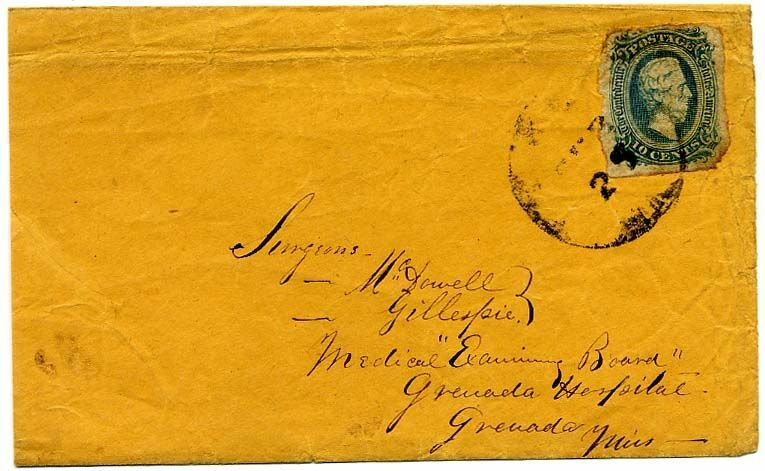 CSA 11-AD, 10¢ blue tied indistinct cds on cover addressed to Surgeons – McDowell / -- Gillespie, Medical Examining Board, Grenada Hospital, Grenada Miss[issippi], bit reduced at left, small tear at right, and file crease across top faintly through stamp. Featured in Terry Hambrecht’s article in the March-April 1987 Confederate Philatelist, page 9 where he points out that examining boards helped elevate the quality of medical care but often left something to be desired, upon which he expounds in more detail. Detailed bio on Gillespie included from the unpublished biographical register of physicians who served the Confederacy in a medical capacity, courtesy of Drs. F. T. Hambrecht and J.L. Koste. Ex Hambrecht. $120. Dr. Henry Allen Gillespie (1936-1879) served in various locations such as Oxford and Grenada, Mississippi including with the 2nd Arkansas Cavalry. More information on linked page. 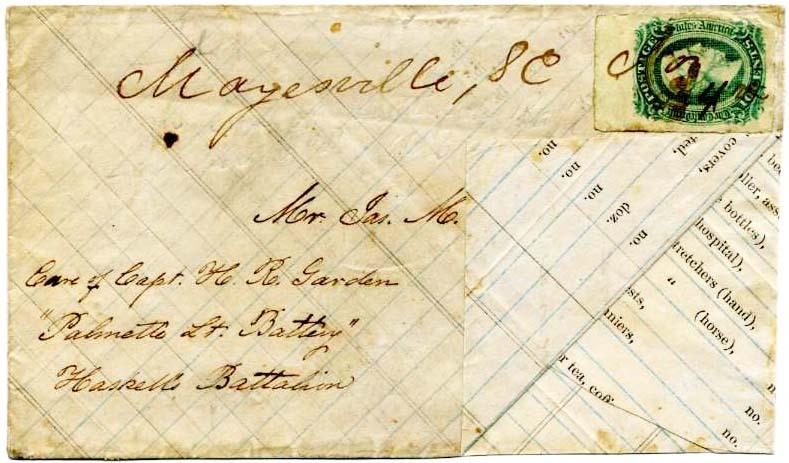 CSA 11, 10¢ blue (4 margins, tiny chips at lower corners) tied bold socked-on-the-nose CHARLESTON / S.C. // JUN / 3 cds on homemade cover to Dr. J.H. Furman, Manchester, So. Ca. Detailed bio included from the unpublished biographical register of physicians who served the Confederacy in a medical capacity, courtesy of Drs. F. T. Hambrecht and J.L. Koste. Ex Hambrecht $120. 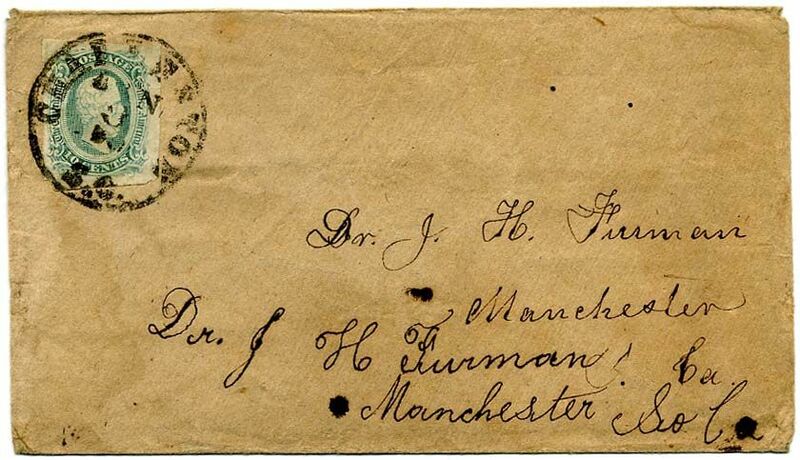 Dr. John Howard Furman (1824-1902) was the grandson of Dr. Richard Furman, the namesake of Furman University. More information on linked page. CSA 11a, 10¢ milky blue tied blue LYNCHBURG / Va. cds on cover to W. B. Withers Esq, Cowan’s Ford, N.C. $130. 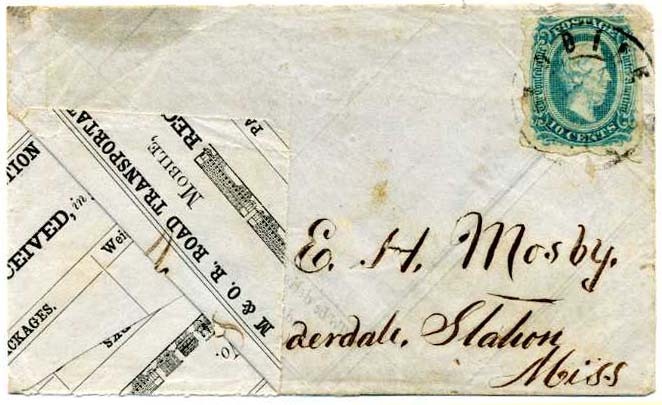 CSA 11-AD, 10¢ blue (4 margins) tied ANV field cancel (CSA catalog Type ANV-11, 10-bar, unenclosed, used 1864-65, CCV $175) on cover to “Edward M. McDermed Esqr, Care Southern Express Co., Richmond, Virginia;” on verso is a note “This letter is intended for Mr. McDermed if he is still in the employ of the Southern Express Co. 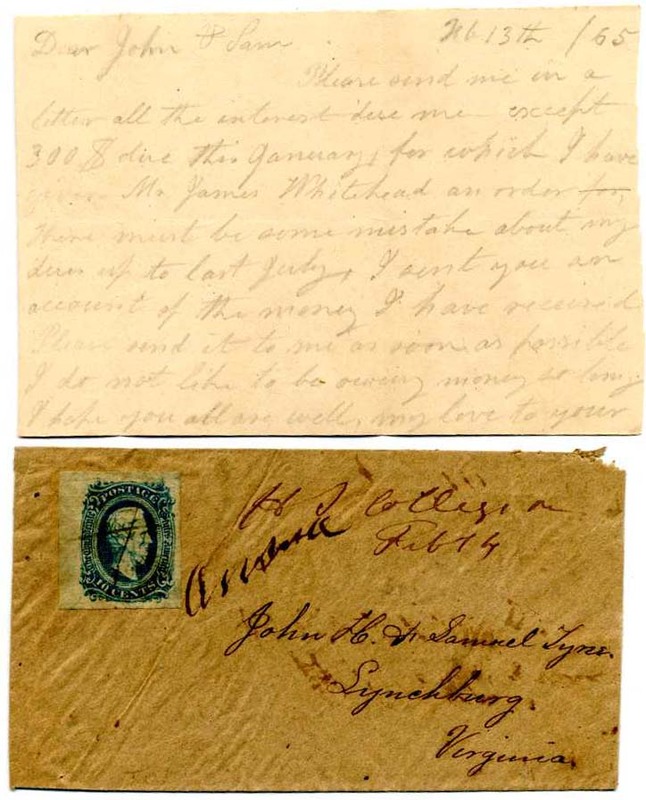 If not, the Express agt will direction his attention to the contents of the enclosed letter.” Unfortunately, we don’t know what those contents were, tiny upper left corner replacement and slightly reduced at left. Interesting soldier’s use from Army of Northern Virginia. $200. 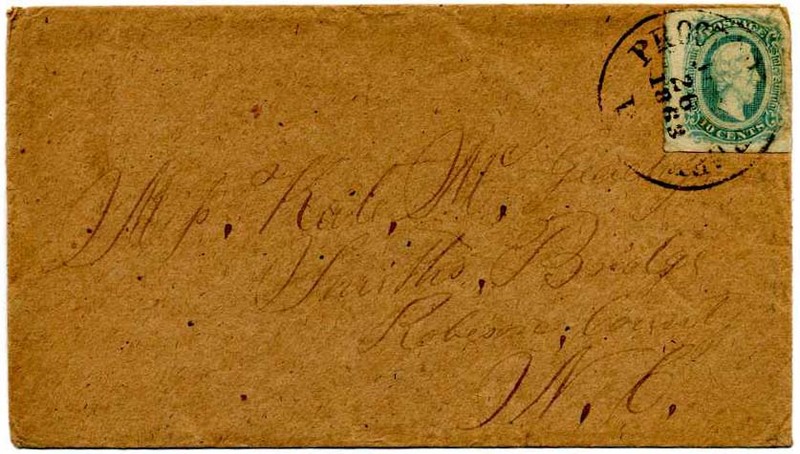 Edward McDermed was a merchant connected to Gish's Mill and constable of Roanoke County, Va. More information on linked page. 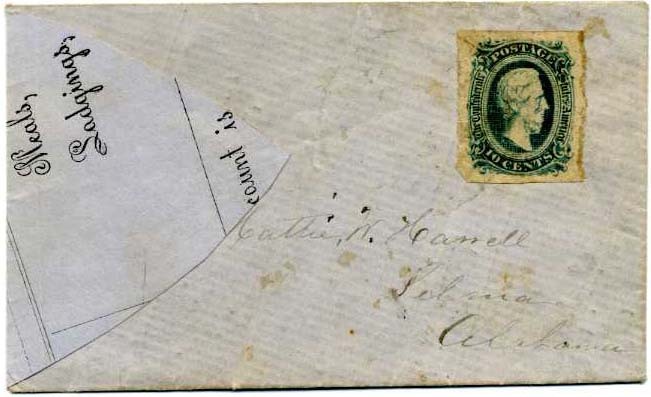 CSA 11-AD, 10¢ blue (4 large to huge margins) tied boldly struck scarce straightline Goodson [Va.] postmark (CSA catalog type SL-03C with month removed, CCV $1,000) on cover to “Mrs. 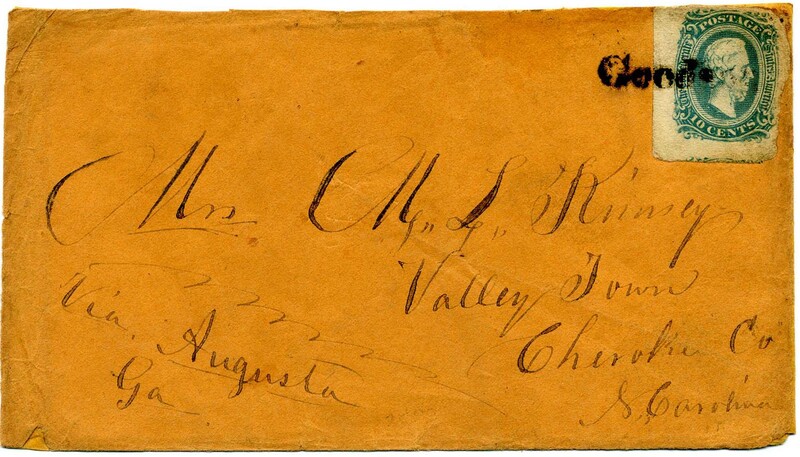 M. L. Kinsey, Valley Town, Cherokee Co., S. Carolina” and routed “Via Augusta, Ga.” Cover with tiny edge repairs. Ex Fisher. $550. 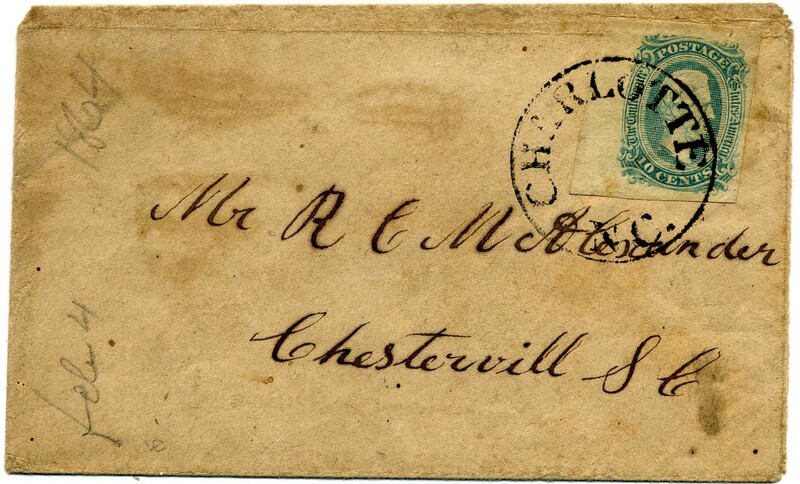 CSA 11-AD, 10¢ blue (4 large to huge margins) left sheet margin single tied beautifully struck scarce dateless black CHARLOTTE / N.C. circle handstamp on cover to R. C. M. Alexander, Chestervill[e] SC, lightly soiled. Docketing indicates use February 4, 1864. $120. CSA 11-AD, 10¢ blue right sheet margin tied CHARLESTON / S.C. // FEB 16 cds on clean commercially made cover to Surgeon General S. P. Moore, Richmond, Va., with “O.B.” at upper left (Official Business), clean blue envelope with embossed flap tip, Extremely Fine. $150. Samuel Preston Moore was Confederate Surgeon General throughout nearly all of the Civil War. More information on linked page.